Mains Power will understand that all failures of our products might lead to your loss. We always by your side to help you solve the Mechnical & Electrical problems happened when you are using our Products. Our Distributors & Agents provide you services to ensure the generator that you use, maintain and repair. Our goal is that: lowest cost for your using, maintenance and repairing, lest loss because of problems. · Brand New Generators, compliant with IEC & International Mechnical & Emission Standard. · Genuine Engine, Alternator, controller, Switches and canopy. · Genuine Parts for generators, such as parts for engine, alternator, control panel and switchs. · Complete set of Documents for Engine/Alternator/Controller, Certificates and Diagram. · Technical consultance & support for before ordering and after sale. · Training at site or production line in factory. · Delivery for shippment, installation and commissioning guiding and help. 1. 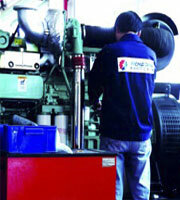 The Generator set must be operated, maintained by staff having experience of operating generating set. Regular maintenance is the main factor that guarantees normal operation of generating sets. If the problems from without maintainance generating sets required, the claims for quality warranty might be not accepted, in accordance with the problems details and description after confirming by us. 2. Warranty includes repairing or replacing defect accessories and spare parts. Principally the trouble is eliminated by repaireing the defect accessories and spare parts. Only when the trouble is identified by Yicheong Power, or the suppliers of Yicheong Power as the trouble that can not be eliminated completely by repairing, can replacing accessories and spare parts be adopted. 2. 12 months from installation and commissioning at jobsite. 3. 15 months from Shippment date from Yicheong Power factory. · Whichever above time comes earlier, will be used as the criterion.